Prepaid users, its time to rejoice. 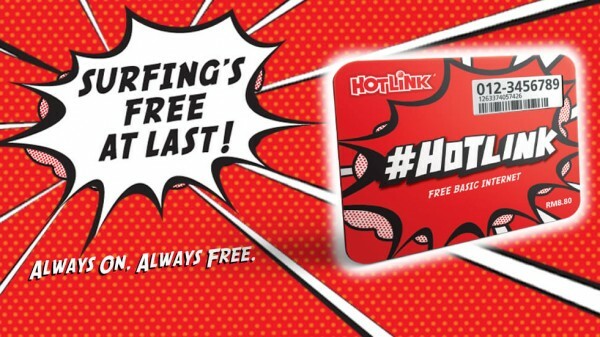 Maxis, via their recently introduced #Hotlink plan now offers free basic internet services as long as your plan is active. While we’ll take a look at the fine print a bit later, what this means is that as long as your account is active, you don’t need to pay anything for basic internet services. So this doesn’t sound like a big deal, but it is. So big that a rival telco decided to troll and make fun of the offer, but deep down they know that by offering free basic internet, Maxis has fired the first salvo in what will be a long war among all the major telcos in the country. Lets examine what Maxis is offering. Basic internet capped at 64kbps as long as your plan remains active, with no other charges. Gone are the days when you would forget to renew your monthly internet pass and wake up to the horror of losing all your prepaid credit the next day. With this #hotlink plan, you can safely buy any smartphone, leave the mobile data services on and not have to pay a single cent for it. Yes, the 64kbps cap might sound like a deal breaker, but it is not. It wasn’t too long ago that the only internet most of us were limited to was powered by a dial up modem capable of a maximum theoretical speed of 56kbps. Yes, it will be a challenge to watch the latest viral video on youtube, but this is not what basic internet is about. We will do a comprehensive review to give you the low down of just what you can and cannot do with 64kbps of internet in the coming weeks. What it is however is that it keeps you connected. The number of connected Malaysians will double, maybe triple over the next couple of years because essentially everybody with a smartphone, on a mobile plan with free internet gets connected. 64kbps is a more then sufficient to use cross-platform mobile messaging apps like Whatsapp and Wechat. This will eventually kill SMS, because it will be free. I’m sure the good people over at Maxis have done the math on this, the only people who still rely on SMS to keep in touch has been plunging with the introduction of more and more mobile messaging apps. This however is just the start, because the other major telcos will wake up to the reality soon enough. Free basic internet is no longer an option, its a requirement and it will be a huge selling point for future subscribers, as well as keeping current subscribers happy. The majority of prepaid subscribers sign on for an internet plan for mobile messaging, as well as social networks. Most barely use 10 to 15% of their monthly allocated data quota to accomplish these tasks, and would jump at the opportunity to only purchase a daily internet pass when they require full speed internet, and drop down to free basic internet the rest of the time. We’re looking at you DiGi, Celcom and Umobile. The dawn of free basic internet is here, and its here to stay.